I am fortunate that I was employed for a time in Biotechnology in the heart of its ‘Silicon Valley’ in Cambridge, MA. Working there, I learned about science and specifically the scientific process and logical thinking. This helped me to grow as a teacher because I learned the way scientists work and think. It also gave me a unique logical and rational perspective into the world of voice teachers making interesting and often outlandish claims. It’s important to keep the following quote by one of my heros Carl Sagan under consideration when we hear or read things on voice forum boards and Facebook groups. When someone makes an extraordinary claim about vocal technique that goes against hundreds and hundreds of years of writing as well as current scientific knowledge, then the onus is on that person to give extraordinary evidence for their claim. 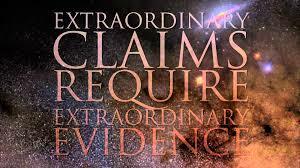 Personal experience, beliefs, or anecdotal evidence are not enough evidence to support an extraordinary claim. It is also not on the person QUESTIONING that claim to prove that it is false. For example, if you claim to have $1 million dollars in your closet, the burden of proof is not on ME to prove that you don’t. You are the one making the claim, you must prove that it is true. There seems to be a great deal of pedagogical relativism among teachers as if all pedagogical ideas are good and should be given ‘equal time’ in discussions and consideration. But that simply cannot be true: there ARE BAD ideas in the teaching of voice in the same way that there are bad ideas in areas of physical health. Eating an unhealthy diet DOES have ramifications. Medical scientists would look askance at someone who believed that bloodletting and trepanning were still modern medical solutions to health problems. Basing a system of voice training solely on conjecture, personal ‘beliefs,’ happenstance, and speculation is to throw arrows in the dark. I’m reminded of the article written by Richard Miller on “Tricky Teachers”: those teachers who do not have a pedagogy built upon a body of factual information, and instead rely on ‘tricks’ and personal imagination in the teaching of voice. Given the diversity of vocal problems and the individuality of the singing voice, it may at times indeed seem that no two voices can be taught in the same general fashion. Are we, however, really to believe that there are no universal principles on which to base a philosophy of vocal production? On the contrary, every voice must obey certain functional laws if freedom is to result. Compensatory “tricks” may randomly be attempted, and on occasion may momentarily serve to correct some technical problem, in the same way that medicine from the medicine chest taken without a medical diagnosis or prescription may seem to alleviate the symptoms of an assumed illness. Just as assuredly as there is danger in “doctoring” without proper diagnosis and prescription, so “tricky teaching” not based on principles of mechanical freedom may cause detrimental reactions in the singing voice. Imaginative teaching is necessary, but inventive teaching based on chance exploration of adjustments to the singing voice is an abomination. Too often it is erroneously believed that such “creative” teaching is easier than taking time to learn how the vocal instrument really works. However, all technical suggestions must be judged against the measurement of functional freedom. Playing “tricks” on a singing voice is not included in the game rules of any respectable vocal pedagogy. Miller, Richard. On the art of singing. Oxford University Press, 1996.. Previous postBut the Professionals Do It!